Brimming with verve, wit, and intellectual curiosity, Gilbert’s absorbing epic embodies the spirit of the transformative 19th century: an age of exploration, industrial expansion, and scientific discoveries which saw people pondering the links between religion and nature. Carrying readers through this sweeping novel of ideas is a singular heroine whose life suits these big themes perfectly. Alma Whittaker is born in 1800, the daughter of Henry, a self-made English entrepreneur whose botanical import-export firm makes him “blisteringly rich,” and his practical Dutch-born wife, Beatrix. Growing up on her father’s large, isolated Philadelphia estate, Alma spends her days studying plants, which are described in loving detail. A brilliant scholar, yet unattractive and overly tall, she abandons hope for romance until, in late middle age, she meets Ambrose Pike, a talented orchid illustrator who shifts her life’s course. The language delights from the get-go. “His penmanship was shamefully crabbed. Each sentence was a crowded village of capital letters and small letters, living side by side in tight misery,” it says of Henry Whittaker, scribbling his account of Alma’s birth in his ledger. Likewise, its structure is refreshingly old-fashioned. As the setting moves from England to America to Tahiti and elsewhere, the author narrates Alma’s lifelong coming-of-age journey in a sprightly voice full of compassionate wisdom. Some secondary characters’ personalities are beyond eccentric, but they certainly keep things entertaining. Without getting preachy, Gilbert reveals much that readers can take away from Alma’s experiences. Everything Alma encounters has something to teach her, from the quiet strength of mosses to her surprising realizations about family members to her own body’s desires. Over the years, she adjusts her views as needed and always soaks up new opportunities. Her story honors scientifically-minded women while demonstrating that it’s possible to create a full life despite personal disappointments. The result is a novel that’s both edifying and very satisfying. 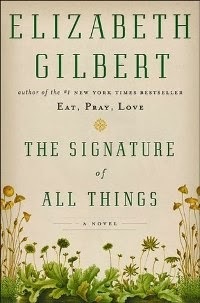 The Signature of All Things was published by Viking in October ($28.95, hb, 512pp). The UK publisher is Bloomsbury (£18.99). This review first appeared in November's Historical Novels Review; it was an Editors' Choice title. I had no idea this was a work of fiction! I assumed it was non-fiction because Eat, Pray, Love was. I'm not sure this is something I'd enjoy, but your review does have me tempted to give it a try. It's her first novel in some time. She started out writing fiction but then attracted huge fame with Eat, Pray, Love and continued in that vein for a while. Not sure it's my #1 favorite for the year, but it comes close. She doesn't weigh the novel down with too much scientific discussion but weaves it in carefully and made me interested enough to read more about the topics on my own. Thanks for your blog. I've read the book and enjoyed it very much. Hi Diane, thanks for commenting about it! I hadn't read Eat, Pray, Love as it seemed far too hyped for my liking but when I saw a NY Times review of Signature, I decided this was my chance to try Elizabeth Gilbert. I agree with many of your observations, however, I ultimately became disenchanted with her very lengthy sentences and detailed descriptions. Even so, I read to the end which I found quite satisfying.